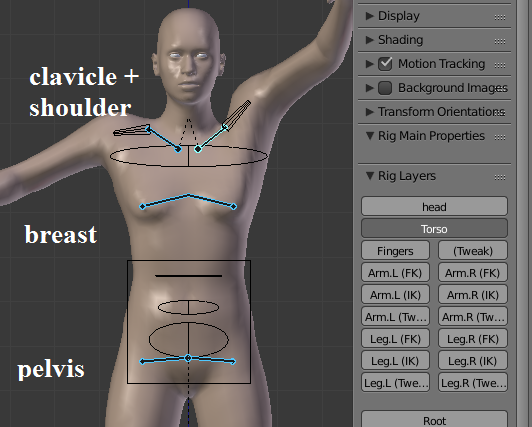 All current rigs for the MakeHuman mesh derive from two fundamental deform rigs. The deform rig defined by the MHX2 importer originates from work that I started with around 2010, and it has evolved continuously since then. For various reasons, in 2014 it was replaced as the official MakeHuman rig by the Default skeleton that you can export from MakeHuman. There are some reasons why you might prefer to use the official rig, e.g. that the weighting is better (so they say, anyway). More significantly, the face bones are only part of the Default rig from MakeHuman, so if you want to do facial animations with face bones, you must use it. 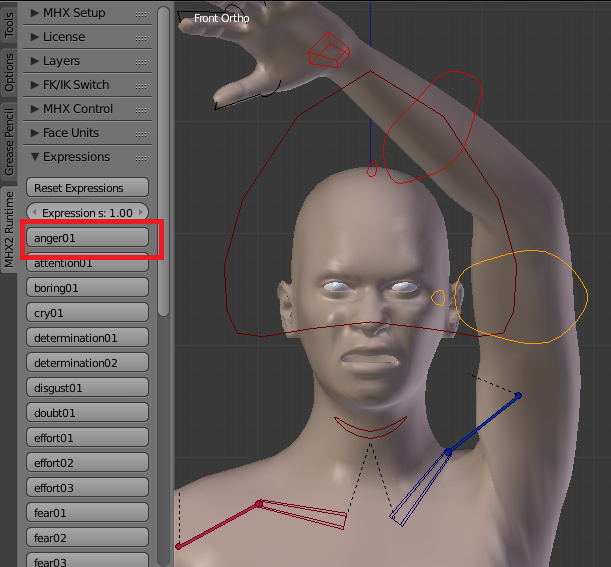 Facial animation is still possible with the rigs defined by MHX2, but it must be done with shapekeys rather than bones. A significant drawback of the official rigs is that they lack interesting control structures like inverse kinematics. The plan was always to add a control rig with a Blender script, but this has not happened yet due to lack of resources. Now I have addressed this problem within MHX2. Designing a good control rig from scratch is not a trivial task, so I wanted to reuse the existing codebase and adapt the imported rig so it fits in there. The result are two new rigging options, which I call Exported MHX and Exported Rigify, which essentially behave like the MHX and Rigify rigs, but are based on the Default deform rig. There are some minor differences though, because the control structure is not entirely independent of the underlying deform rig. 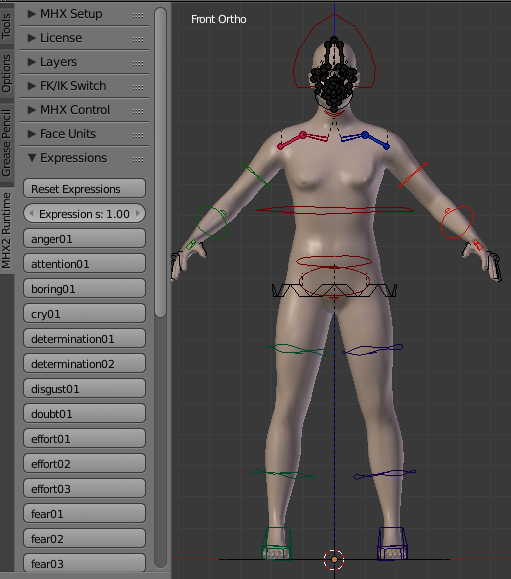 Above all, the new rigs have the facial bones, so you can use the expressions described in the previous post with them. 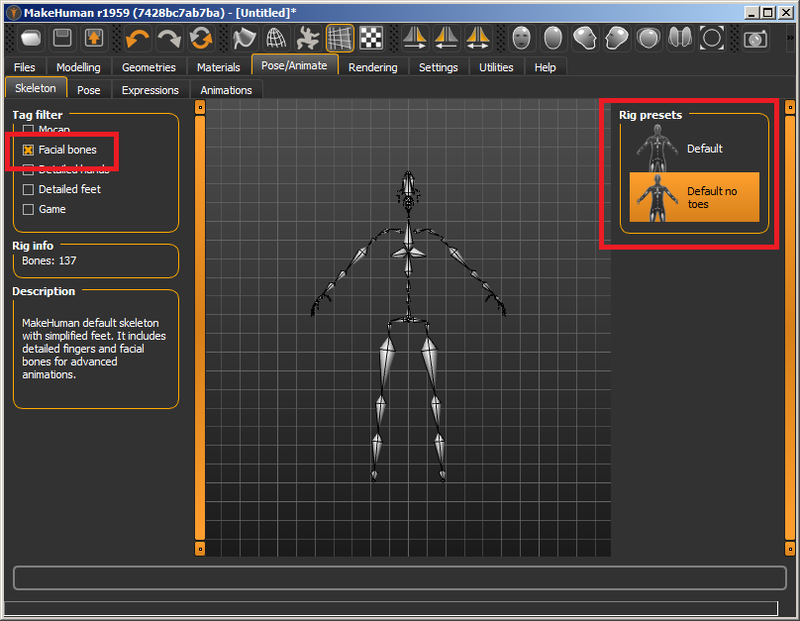 To use the new rigs, you must first export them from MakeHuman. Select one of the skeletons with Face bones, i.e. Default or Default no toes. The latter is strongly recommended, because the toes in the Default rig do not interact well with complex foot rigs. Export the character as mhx2, including Expressions among the export options. 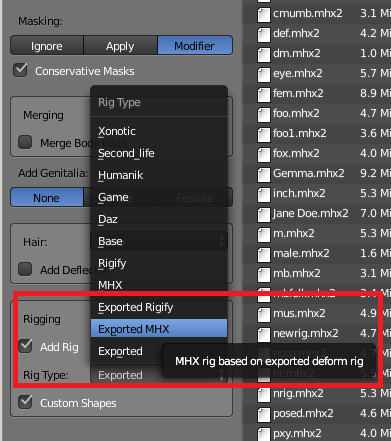 In the MHX2 importer, there are two new rig types: Exported MHX and Exported Rigify. The Exported MHX character has almost the same bones as the original MHX, apart from the face bones on the Head layer. In the MHX2 tab we see both the panels associated with the MHX rig as well as the Face Units and Expressions panels. There are some additional minor differences compared to the original MHX, e.g. that the shoulder consists of two bones and that the hand bones are very small. In the Exported Rigify rig the face bones are placed on layer 2, which is unused by Rigify. 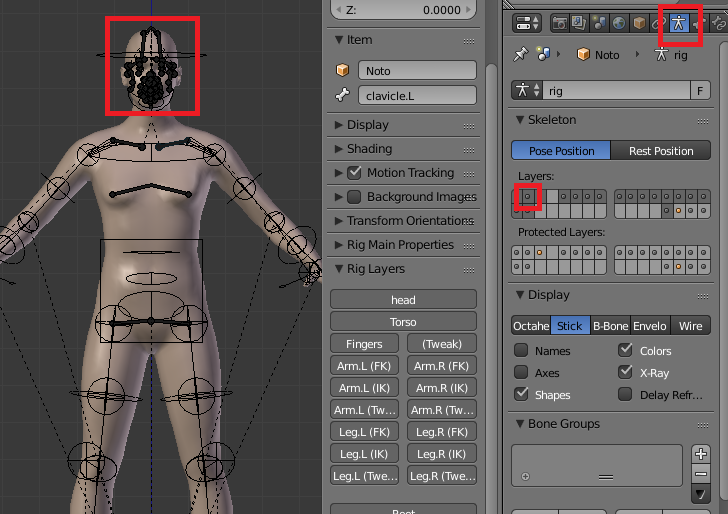 Note that you must toggle visibility of this layer directly in the armature context; the Rig Layers panel does not know about the face bones since they were not created by the Rigify plugin. Other difference compared to the original Rigify are new bones on the Torso layer (layer 3). The shoulder consists of two bones, there are breast bones which deform the chest, and pelvis bones that affect the deformation of the hip.